Adversity has many effects. It can break a person. It can also transform a person. The type of adversity that occurs when a parent is incarcerated affects millions of children every single year. Imagine what it would be like as a child if the person who took care of you, fed you, and provided a home for you was suddenly whisked away into a prison cell far from home. That is the horror that over a million children experience every single year in the United States–their lives, their homes, and their entire existence are disturbed, changed, and sometimes even destroyed when a parent is incarcerated. For millions of children, the security of childhood which should be about family dinners, school plays, sporting events, and special holidays is ripped apart by fear, police visits, arrests, lawyers, trials, jails, and prison visits. Children of incarcerated parents and justice involved people are packed up and sent away to live with aunts, uncles, or grandparents if they are lucky, and if they aren’t lucky, they become wards of the state, moving from foster home to foster home. These are the harsh realities that children in every town, city, and state in our nation are facing, and despite common misconceptions, these children come from every conceivable background, religion, and socio-economic group—the victims are as varied as are the people who live in the United States of America. Stephanie Tinsley Regagnon, never dreamed such a reality existed, much less that it would intersect with her normal, middle-class, Midwestern, twenty-something, college-graduate life. Adversity though, knows no boundaries and heeds no barriers. Stephanie is proof that literally anyone at any time can find themselves thrown into a nightmare scenario that involves a parent being accused of a crime, prosecuted, and sent to prison. A phone call on January 1, 2005 forever changed Stephanie’s life and in turn, the lives of children of incarcerated parents. On that New Year’s Day, Stephanie learned that her family’s restaurant and bar had burned, and it wasn’t long before the only suspect in the fire was her mother, a former college teacher and coach, as well as the mayor of their small Midwestern town. Despite her steadfast claims of innocence, and little to no evidence linking her to the fire, Stephanie’s mother was sentenced, prosecuted, and sent to federal prison under the Patriot Act for “Interfering with Interstate Commerce by way of Arson”. Even though this charge is normally reserved only for the worst of the worst—terrorists—Stephanie’s mother was charged, tried, convicted, and sentenced to 63 months in a federal prison. Before her mom was sent to a federal prison camp in Bryan, TX, Stephanie married the love of her life in what was the last truly happy occasion her family would enjoy together for the next five years. While her mom was in prison, Stephanie, at her mom’s insistence, became pregnant and gave birth to a baby girl she named Ava Grace. Stephanie’s vision for Ava’s Grace Scholarship Program was born out of her many visits to her mother during her incarceration. It was a vision inspired by the unlikeliest of things…a vending machine in visiting area of the prison. As Stephanie sat waiting for her first visit with her mother in prison, she noticed that even before the other visitors sat down, they rushed the vending machine before heading back to their tables with their purchases. Children of all ages eagerly grasped candy bars, potato chips, and sodas as they hurried back to their tables where they carefully arranged the treats. It was a scene which made no sense to Stephanie on that first visit, but as time went on, she understood why the ritual took place each visiting day—these kids wanted their visits with their moms to be as special as possible, and one way to achieve even a tiny hint of specialness was to have their mom’s favorite treats purchased and waiting for her when she arrived. Also, they didn’t want to waste even a minute of their time standing in line at the vending machine because these visits were all they had of their mother’s time and attention. It was their time to spend, to share, to bond. Before that first visit, Stephanie had never been to a prison before, and quite honestly it wasn’t someplace she had ever dreamed she would set foot inside. It was a nightmare, an out-of-body-experience, and it was an adversity she would grow out of and which would transform her. No longer was Stephanie shielded from the ugliness of incarceration; no longer was the heartbreak and horror of watching someone you love be led away in handcuffs something to which she could not relate. These realities and so many more harsh lessons were hers to experience, accept, and overcome. Stephanie was an adult when her mother went to prison, and that was a blessing she became ever-more thankful for as she watched young children visit their mothers in prison. She wondered how these children would ever recover, and how they would ever be able to overcome the separation from their mothers and all the damage that did to them. Stephanie decided that helping the children of incarcerated parents was something she could do to turn an extremely negative experience into something positive. For her it was mental and spiritual survival to try to find purpose in what was happening to her family. 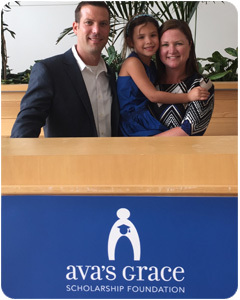 Stephanie, with the support of her mother, step-father, husband and close friends, founded Ava’s Grace Scholarship Program. Education was always a priority in Stephanie’s family when she was growing up, and she wanted to be able to give hope to young people who had been impacted by parental incarceration. 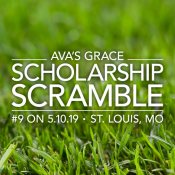 Ava’s Grace Scholarship Program’s mission is to break the cycle of incarceration through the gift of education by awarding scholarships for higher education to children of incarcerated parents. Ava’s Grace awards recipients with scholarships of up to $5,000 for up to four years and provides a robust networking experience to compliment the financial support.